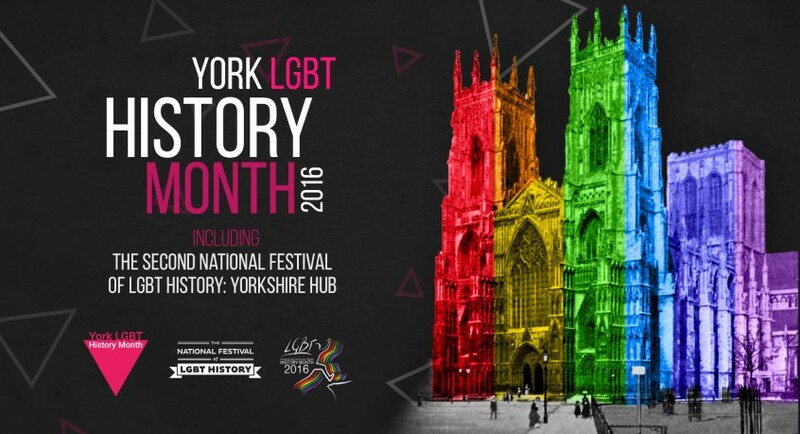 Blog York LGBT History Month 2016 - nearly 50 events! York LGBT History Month 2016 sees a record number of events take place this February in and around the city of York. The entire community has come together to put on a schedule of presentations and discussion, films and theatre, talks and activities, school and families events and much much more. All events are open to all members of the public and the majority are free of charge. We’re particularly excited and proud that this year York hosts the Yorkshire hub of the National Festival of LGBT History. It gives the city a huge opportunity to celebrate the forgotten stories of LGBT people and their vital contributions to notable moments throughout Yorkshire’s history. To reflect this year’s national theme, some of the events taking place will be linked to the topics of religion, belief and philosophy. Representatives of the major faiths in York will be participating in discussion panels and other activities to explore the past, present and future of this fascinating subject. Throughout February, there are nearly 50 individual events taking place, beating last year’s tally by almost 20. We’ve been overwhelmed by the response of York’s community to our call to arms to organise their own events and become part of the festival. LGBT History Month is celebrated worldwide and in the UK it became a national campaign back in 2005. The purpose of the month of events and activities is to increase the visibility of lesbian, gay, bi and trans (LGBT) people [note: we use “LGBT” as an umbrella term including any non-binary and/or non-cisgender and/or non-heterosexual and/or intersex identities and so on], their history, lives and experiences among communities. The ultimate aim is to raise awareness and advance education on matters affecting LGBT people in order to progress their welfare as a community, and as a result benefit wider society. For the third year running the community has come together to create a spectacular programme of events throughout February. This year we see the number of events increase once again, but more importantly the programme brings a greater level of diversity. A much larger number of contributions focus on trans identities, including contemporary perspectives on access to healthcare, representation and interactions with practical theology. We also have a sprinkling of events catering to this year’s theme of religion, belief and philosophy and how this interacts or intersects with LGBT identities. It’s excellent to see such an array of voices pushing to foreground the forgotten stories of LGBT people and to discuss the wide variety of issues still faced by many. Our school outreach works within and alongside the programme of events to establish an inclusive environment at a key developmental stage. Our overarching aim is to develop inclusivity, challenge stereotypes and promote understanding. More information including the full programme can be found on our events page. York LGBT History Month 2016 is kindly supported by Aviva, Barefoot Wines, The Ben Cohen StandUp Foundation, Joseph Rowntree Foundation, Sodexo, Two Ridings Community Foundation, University of York, York Pride and York St John University. We are hugely grateful for the support these organisations have offered us. Andy Law, Lead Coordinator: Andy works at York St John University and led the 2014 campaign as its LGBT Staff Network Secretary before forming an independent organisation to oversee its future. Andy just completed an MA in Sociolinguistics at the University of York and has started a PGCert in Diversity Management at the University of Bradford. Former Secretary of both York Pride and York LGBT Forum, Andy has been involved with York’s LGBT groups and organisations since 2010, and is currently also Vice Chair of the newly-formed York Vegfest. Kit Heyam, Secretary and Outreach Coordinator: Kit is a postgraduate teaching assistant and PhD candidate at the University of Leeds with a thesis entitled ‘Literary and historical representations of Edward II and his favourites, c.1305-1700’. He has been coordinating York LGBT History Month’s school outreach programme since 2014 and now also serves as Secretary. Kit delivered a talk at the University of York as part of the 2015 programme and another talk as part of the national academic conference. Colin McNichol, Treasurer: Colin is a self-employed electrician working in property maintenance. He has been actively involved in York’s best-known LGBT organisations since 2012 and joined the York LGBT History Month team in 2015. He has previously served as Events Officer for York Pride, coordinating regular club nights to raise funds, and currently manages the charity’s finances as Treasurer (he’s York’s LGBT treasurer!). Colin is also a member of York LGBT Forum. Russell Norton, Social Media Coordinator: Russell is a consultant at scarlettabbott, an internal communications agency. An alumnus of the University of York, Russell has lived and worked in York since 2004. Anu Priya, Volunteering Coordinator: Anu is the Student Opportunities Coordinator (Volunteering) at University of York Students’ Union and was formerly Opportunities Coordinator at York St John Students’ Union. She moved to York in 2010 to do her MA in Counselling at York St John University and has since made York her home, living here with her husband and daughter. Volunteering has been a part of Anu’s life since she was a young girl and it’s something she is passionate about along with equality and diversity. Adrian Lee, Assistant Coordinator: Adrian works at the University of York where he previously completed a BA with a dissertation on secondary school homophobia and heterosexism and a PhD on the identities and welfare needs of gay men in later life. He is part of the university’s LGBTI Matters staff forum and joined the team in 2015 after helping organise talks for the 2014 and 2015 programmes. Adrian also actively volunteers for a health charity across York, North Yorkshire and Teesside.